Disney Publishing Worldwide announces that it is launching W.I.T.C.H., a new book series about five ordinary friends with an extraordinary secret - they each have the power to control a natural element. W.I.T.C.H. is the acronym of the first names of the 5 heroines. (the voice of adult Bambi) on September 16, 1939.
becomes master animator Fred Moore's assistant at the Disney Studio. from Disney's So Dear to My Heart. is released. It is Uncle Scrooge's first major animated appearance. At Disneyland, 101 privately-owned Volkswagen Beetles parade down Main Street to celebrate Herbie Day (to promote The Love Bug film). The cars are judged in the categories of most psychedelic, toy-like, comical and best personality. Volkswagen Beetle, presented by The Love Bug stars Dean Jones and Michele Lee. The Wonderful World of Disney airs the episode "Welcome To The World." Hosted by actress/singer Lucie Arnaz, the show celebrates the opening of the Magic Kingdom's new thrill ride Space Mountain! Mouse Club (from 1991 to 1993) is born in Fountain Valley, California. She also co-starred in Disney's 2008 comedy feature Bedtime Stories. All New Mickey Mouse Club TV series, is born in St. Paul, Minnesota. The Walt Disney Company signs a contract with the French national, regional and local governments, which promises Disney: favorable loan terms; that the rapid transit railway system will be extended to the theme park from Paris; that two interchanges will be built to link Euro Disneyland with a main highway; and that a special station for high-speed trains will be constructed at the park. The Walt Disney Company and McDonald's Corporation sign a 10-year multi-national promotional alliance, set to begin in January 1997. At the 70th Academy Awards, Don Iwerks (co-founder of Iwerks Entertainment) is given the Gordon E. Sawyer Award for accomplishments in the field of motion picture science and technology. Iwerks, who in his early years worked for Disney, is the son of legendary Disney animator/mechanical genius Ub Iwerks. "My Heart Will G On" (from this year's big winner Titanic). Disney's Miramax Pictures release Good Will Hunting (nominated in 9 categories) wins Best Supporting Actor (Robin Williams) and Best Screenplay Written Directly for the Screen (Matt Damon and Ben Affleck). to Town" airs for the first time on the Disney Channel. An animated 3D Mickey Mouse presents the Best Animated Short Oscar (to The ChubbChubbs!) at the 75th Annual Academy Awards hosted by Steve Martin. The Disney distributed Spirited Away is awarded Best Animated Feature, beating out Lilo & Stitch and Treasure Planet. Chicago (a Miramax Film - a division of The Walt Disney Company) wins 5 Oscars! The Main Street Electrical Parade gives its last performance at Disneyland Paris. in 1975, and became its first president and chairman. Crockett miniseries - "Davy Crockett's Keelboat Race" and "Davy Crockett and the River Pirates." during an episode of Cory in the House on Disney Channel. Meet the Robinsons meet and greet guests at the Disney-MGM Studios. The 9th Marc Davis Lecture on Animation takes place in the Samuel Goldwyn Theater in California. This year's event features two time Academy Award winning animation impressionist Frédéric Back. Roger Federer, the world’s No. 1 ranked men’s professional tennis player, attempts to "pull the sword from the stone" in Fantasyland at Disney World's Magic Kingdom. Federer is visiting Disney World during Easter weekend before heading to Miami for the 2008 Sony Ericsson Open. Actress Amanda Plummer - the voice of Clotho in Disney's animated Hercules - is born in New York City. She can also be heard as Professor Poofenplotz in an episode of Phineas and Ferb. shows him what will happen if he doesn't change the error of his ways. 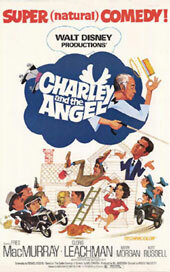 Nominated for a Golden Globe, it is MacMurray's 7th and final Disney film. snowy sidewalk. Home Made Home, directed by Jack Kinney, finds Goofy attempting to build a house. "There is only one Walt Disney ... He is the greatest producer the industry has ever turned out." Disney's Touchstone Pictures releases Pretty Woman, a romantic comedy starring Richard Gere and Julia Roberts and directed by Garry Marshall. Film, television and theater actress Joan Crawford is born in San Antonio, Texas. 1964/65 World's Fair in New York! Shareholders re-elect Walt Disney Co.'s board slate, including Apple Inc. Chief Executive Steve Jobs and 12 other nominees. Shareholders at the annual meeting held in Salt Lake City also approve a motion to give themselves an annual advisory vote on the Burbank entertainment giant’s executive compensation. A Day in the Life - John Lasseter, a documentary by Leslie Iwerks, is filmed. Shot during the end of production on Cars 2, the promotional video will be released in July. Disneyland in 1968, she was chosen as the park's new Ambassador in November 1969.
was named a Disney Legend in 1998.
the Muppets characters, begins airing on Disney Junior and Disney Channel. Films, premieres on Disney Channel and Disney Junior. About a girl named Dottie "Doc"